In his will George Moore refers to "the park gardens and pleasure grounds at Whitehall". The pictures below which once hung in the house at Whitehall show how the gardens may have looked in the latter part of the C19th. Extensive gardens such as these must have taken considerable upkeep and maintenance. Domestic servant and gardener at the time of the 1871 census was Scottish born George Potter who lived with his wife, Catherine who hailed from Edinburgh, and two children, John Barr and Agnes, in the Lodge House at Whitehall (pictured here on the right). By the time of the 1881 census, George, now 52 years old, was joined by his now 20 year old son, John Barr Potter as a servant/gardener on the Whitehall Estate. By 1891 John Barr Potter is shown living in Whitehall Lodge House with his now widowed mother and his younger sister. By this time another member of the Barr family, John Potter (possibly George Potter's younger brother?) is shown working as a servant/gardener and living in the Lodge at Whitehall with his Sussex born wife, Mary and their 7 years old daughter, Mabel. So the gardening at Whitehall looks to have been very much a family affair! 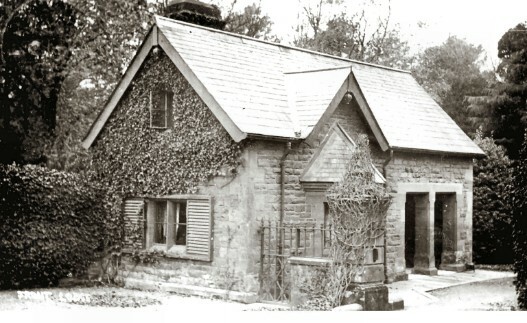 It has been reported to me that one of Whitehall's retired gardeners lived in the cottage which is now an annexe to The Old Post Office in Mealsgate. In his booklet on The History of Whitehall, Mick Jane poses a question about the photograph on the right asking, "Does this show George Potter and his son, John Barr Potter?" 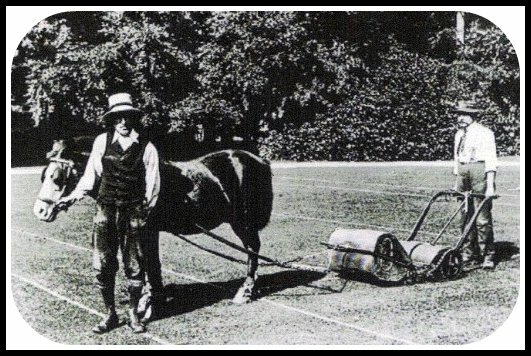 Note the pony appears to be wearing "slippers" to prevent damage to the lawn by its hooves, a common practice with horse-drawn mowers and rollers. Above: Potters' Lodge at Whitehall.